OK, time for some news. I must have managed to do something right, because Mrs. IM is pregnant! A few months ago (I’ve been sitting on the news out of a sense of cautious optimism), I came home from work and heard my wife say that one, short, completely life-altering sentence: “I’m pregnant.” Needless to say, my world was suddenly completely upended. I remember walking around as if in a daze. I had trouble sleeping. Something tipped off my colleagues when I locked myself out of my office for the third time within a week! I’m thrilled. And terrified. And petrified. And not sure what to think. In other words, I’m behaving like any red-blooded male after hearing those words. This will be our first child, and while we’re definitely excited, the news that one will soon become a parent also brings with it a healthy amount of apprehension: Am I ready/responsible enough to take care of a child? Will I be a good parent? Can I provide for my family if we’re down to one income? And (gulp!) how much do babies cost? I could use some advice from you parents out there. That statement about how children don’t come with an instruction manual? Yeah, the significance of that statement has suddenly reared up and smacked me in the face. I was the youngest child in my family, and I never lived close enough to any of my younger extended family members to see the day-by-day of raising a child. So, if any of you have any words of wisdom for a poor old clueless sap like me, I’m all ears. We don’t know the gender yet, and Mrs. IM (a tough woman, I might add) is emphatic about a home birth with a midwife. Come December-ish, things are going to start getting really interesting around the IM household. Gulp. P.S. Oh, and that little bundle of fruit-basket joy up above? 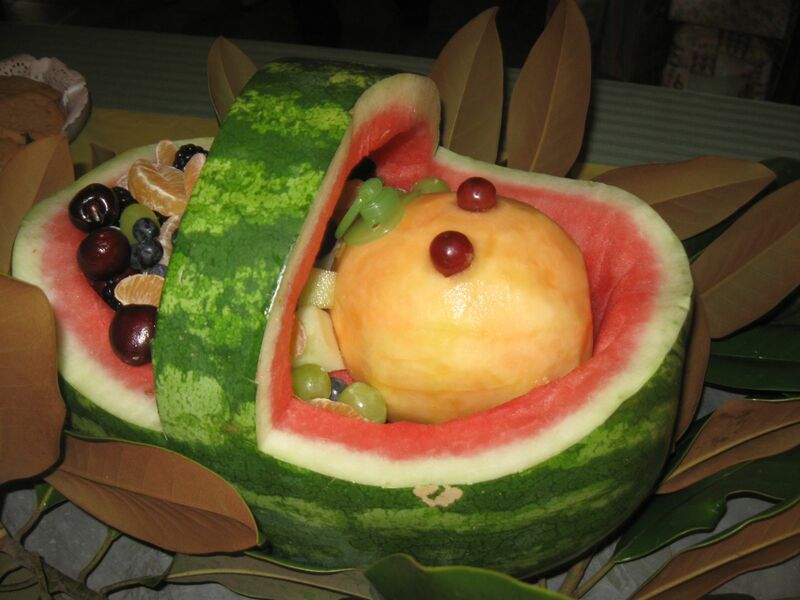 That’s what my mother-in-law made for a baby shower we had recently. Sweet!